Are you tired of having to walk outside to untangle your flag from around the flag pole? Well you no longer have to suffer the frustration of your flag wrapping around your pole. 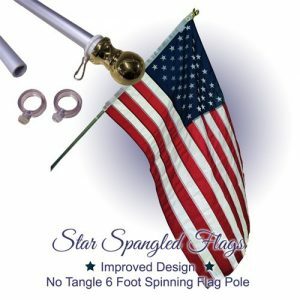 Our tangle-free spinning flag pole will keep your beautiful flag flying high, proud and tangle free! View cart “White No Tangle Flag Pole with Gold Globe” has been added to your cart. 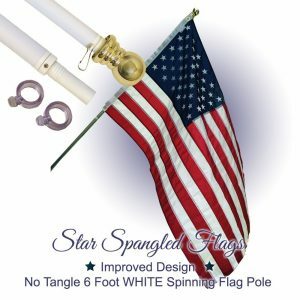 Best Selling White Aluminum Spinning (Tangle Free, Multiuse) Flag Pole! Rust Proof! Wind Resistant! – Or your money back! Best Selling Brushed Aluminum Spinning (Tangle Free, Multiuse) Flag Pole! Rust Proof! Wind Resistant! – Or your money back! You can dress up your own home or business with any of our wall mounted no tangle flag poles! dOur no tangle flag poles are made with high quality white and brushed aluminum that is tough and guaranteed to last. Aluminum is an ideal choice for no tangle flag poles as it is light weight yet tough, resistant to corrosion and has a high oxidation resistance. 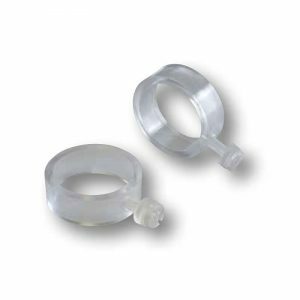 Aluminum is also non-absorbent thus an effective barrier against gases and liquid. You may fly any 2’ x 3’ or 3’ x 5’ sleeve or grommet flag on our flag poles. We offer 5’ or 6’ poles to meet your individual need. 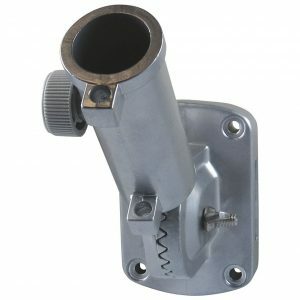 Need a flag pole bracket / mount for your flag pole? We have you covered! 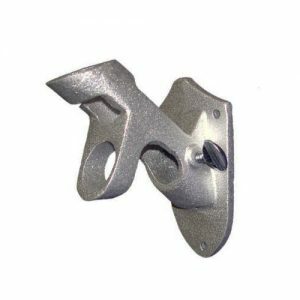 We offer an adjustable bracket and multi-purpose mount in silver or white, both also made of tough aluminum.